Name one of your greatest fears. Now write down all the ways that it secretly thrills you. Sometimes, the thing we fear most is exactly where we need to go. It can be something we secretly want to do. Or something we want to explore but were told not to. Or maybe it’s something we are just curious about. Could it really be that bad? Sometimes it’s something to learn from. It depends on your fear. Jot down five of your fears. What keeps you up at night? What is that thing you’ve always wanted to do but are afraid to? What do you dream about that makes your cheeks flush to remember? Maybe it’s a secret longing. Maybe you just want to know if you have what it takes to face it. What are you afraid of? Write for fifteen minutes. Journal about it. 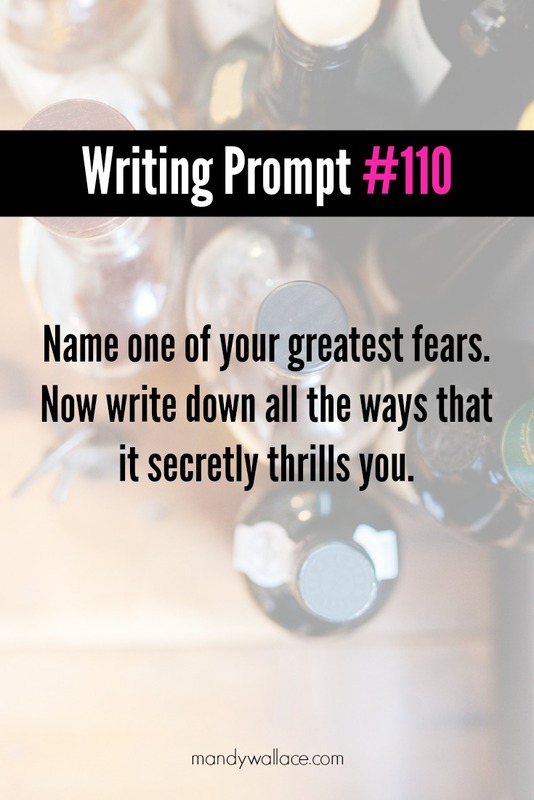 Or write out your fear through a protagonist who is strong enough to face it. Don’t worry about where the story is going when you start to write. Trust the first image and follow where it leads. This is not the time for questions, logic, or planning. It’s just practice. When you feel ready, share your results in the comments. You could share part or all of your story. Or you might share a little about your experience writing with this prompt. Try 58 Science Fiction Writing Prompts, or the slew of story-igniters from the writing prompts category. I went over on this one by 6 minutes but it was so exhilarating writing this. For a while now I have had a huge fear of drowning. I have nightmares about it and can’t even look at pictures of things underwater. So it was really nice writing about a character over coming that fear. Here is only a little bit of it. Looking around I could see the base of the cliff and realized I was close to the shore. I wouldn’t have that far to swim when I reached the surface. I was getting close so I let out some air and allowed myself to sink. I wanted to be a different person when I came out of the ocean. I felt the need to be cleansed. I thought through all the people that had hurt me. My dad killing himself and my mom leaving me because I looked like him. The boy that asked for too much but gave nothing in return. The teacher who is too judgmental and the best friend that doesn’t understand. The list could go on and on. I wanted to escape them all. To be someone different and meet new people. So as the burn in my lungs became unbearable I thought up a plan. I got in my car and started driving up the coast. The ocean no longer scared me and the people in my life no longer controlled me. I like that you transform your drowning fear into a sort of renewal instead, as though just the old/outdated part of the character drowned. I’d be interested to see where this story goes. Thanks for sharing it, S.E.